I wonder how many people reading this are old enough to start bobbing their head to the vintage FM radio reference in the title? Classic rock preferences aside (give it up for REO Speedwagon! ), all of us can certainly appreciate a well-expressed exploration of remittance electronification. 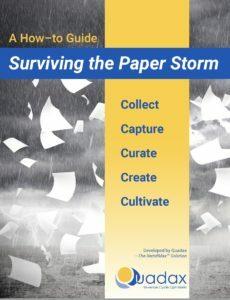 That’s why we recommend that you run, don’t walk (figuratively speaking) to download the new (and free) e-book by our friends at Quadax entitled Surviving the Paper Storm. As healthcare payment electronification begins to become more and more important to the bottom line, it’s vital to have tools like this e-book, to make a complex topic crystal clear. In today’s electronic age, paper doesn’t compute. The healthcare industry, still being heavily paper-based, manually processes more than a third of remittance advice transactions. With manual transactions costing on average $4 more than electronic transactions, this costs medical providers $1.23 billion each year. It may be time to ask yourself how much The Paper Storm is costing your company and what can you do about it. It’s a quick and information-rich read — well said, Quadax! We can certainly relate to the topics!